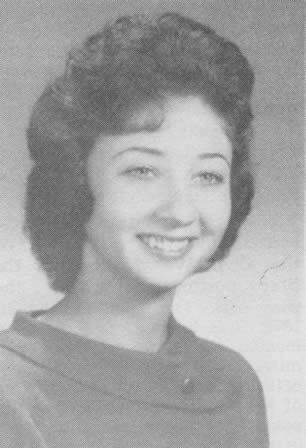 BETTY BLEVINS, a 1962 graduate of Blue Eye High School, is a first-year college student at The School of the Ozarks and is majoring in elementary education. She is the daughter of Mr. and Mrs. Ellis Blevins who live two miles south of Blue Eye. Spreading across a small portion of the Missouri-Arkansas line, thirty miles south of Galena, is Blue Eye, the southernmost town in Stone County. 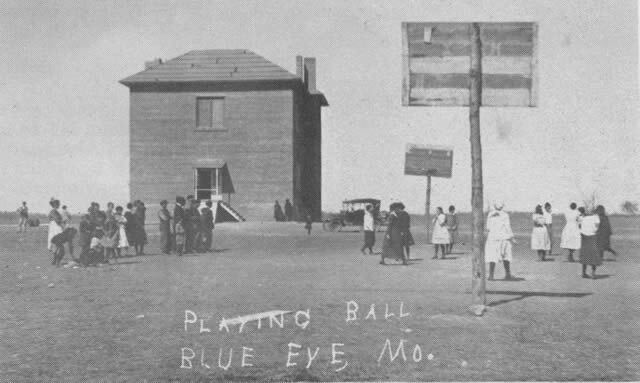 Since the post office has always been located north of the Arkansas line, it is called Blue Eye, Missouri, although a good portion of the town is in Arkansas. This section was for thousands of years the home of Indian tribes. The early settlers found and kept as curiosities arrowheads, stone hammers, metates or corn grinding trays, mortar and pestles used for preparing dried buffalo meat for the pot. Later came the Spaniards who owned certain tracts of land in the vicinity. 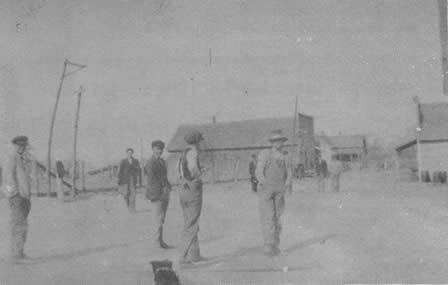 About one hundred years ago, the first White settlers came to this district. They were the Butlers Pittmans, Rhodes, and Cravens hardy and individualistic pioneers who were descendants of the pioneers who had settled in Kentucky, Tennessee, and the Carolinas. At that time, the flat land at Blue Eye was covered with shaggy brush and bluestem grass and was known as "Butler's Barrens." Mrs. Pittman was one of the first settlers to come to Blue Eye and was the last surviving charter member of the First Missionary Baptist Church. 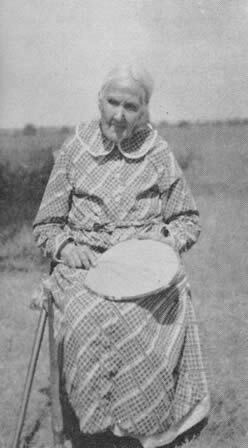 As more settlers came to the Ozarks, a rough wagon trail was evolved by trial and error, running from North Arkansas through Berryville and Green Forest, through Butlers Barrens to Reeds Spring, and on north to the markets of Springfield, Missouri. This trail came to be known as the "Wilderness Road," and it passed about a mile west of the present site of Blue Eye. The first freighters used spans of patient, plodding oxen to pull the canvas covered wagons loaded with fruit, eggs, butter, poultry, and other produce on the long trip to Springfield. On the return, they were filled with merchandise. Later mules and horses replaced the oxen and the trip from Blue Eye to Springfield diminished to a three-day haul. If the freighters left Blue Eye on Monday, they would get to Springfield on Wednesday. 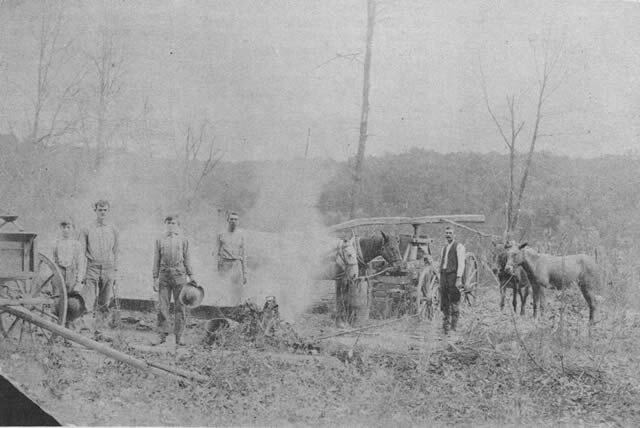 After they had loaded the wagons for the return trip, they would reach the Hedgepeth farm near Nixa, camp over night at the spring, and usually get back to Blue Eye by late Friday night. The oldtime freighters were a rough and ready lot. Sometimes as many as twenty-five wagons would spend the night at the same camp ground. During bad weather, the men had to lie under their wagons, wrapped in rain- drenched or snow-covered blankets, waiting for the end of a long stormy night. Their method of packing eggs which they hauled from Blue Eye by the wagon load was crude but effective: a layer of straw was spread in the bed of the wagon and on this straw was placed a solid layer of eggs. Then came another layer of straw, then more eggs, and so on until the wagon was full. Breakage was remarkably low. Today the Wilderness Road exists as State Route 13 to Reeds Spring and as U.S. 65 on to Springfield. Passenger cars and trucks cover the distance between Blue Eye and Springfield in less hours than it took days, two generations ago. The territory around Blue Eye was a favorite roosting place for the now-extinct passenger pigeons on their migratory flights. Early settlers told of the birds settling on trees in such number that heavy branches would break under them. Hunters came from as far away as Texas to kill and salt down a wagon load of the pigeons for their own use or for the market. During the Civil War days, Blue Eye was virtually deserted because of the border warfare. Marmaduke's guerrillas terrorized the district, raiding and killing, recognizing no law except their own. One of the few settlers who remained at Blue Eye during this time, a Mr. Rhodes, was killed when guerillas raided his farm for horses. When they emigrated from the Southern hills, the early settlers brought with them the omens and superstitions of their forefathers. A story is told of one settler, a Mr. Nelson, who had inherited a trunk that made a knocking sound in warning of an impending death in the family. One day the trunk began to knock and kept knocking for so long that the old man in desperation and anger threw it out in the woodyard and broke it up. During the year, five of his seven daughters died of typhoid fever. The daughters are buried in the Blue Eye cemetery. Elbert N. Butler, a dark- haired, blue-eyed veteran of the Civil War, became the first postmaster when the post office was established in 1870. It is believed to have been located in his home about two miles north of the present post office. The story is told that one of his friends suggested that the post office be called "Blue Eye" in his honor and so it was that the tiny settlement got the name it has borne for ninety-three years. The post office became a money order office in 1907. Cue Butler, the twenty-second post master of Blue Eye, is a veteran of World War II and is a relative of the first postmaster. As a whole, Blue Eye has always been a religious community. In 1883, a Baptist Church was formally established. It has changed sites several times, but it still remains the First Missionary Baptist Church of Blue Eye. The first minister was W. A. Bailey. Others who have served through the years are John Spurlin, Tuck Minick, S. McCoullough, J. B. Rose, and Earnest Rose. The present minister is the Reverend Quentin Middleton. The First Free Will Baptist Church was established in 1928, and its present pastor is the Reverend Gary Terrell. 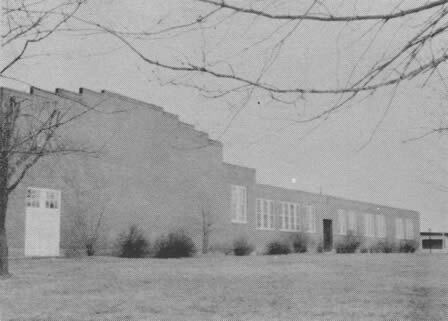 In 1918, the Southern Baptist Convention and the citizens of Blue Eye established a mission school known as the Mo-Ark Baptist Academy. It did much good during the years it operated. A number of noted people received their high school education from the Mo-Ark Academy. In 1930, it closed, yielding the field of education to the consolidation of schools here. 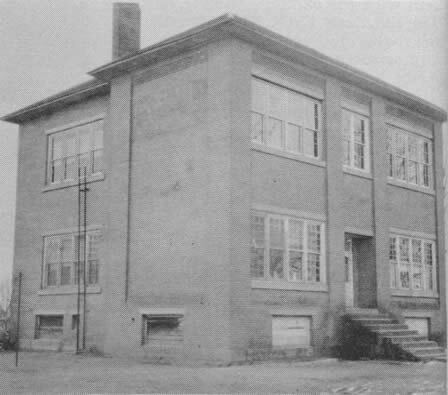 Its building, an imposing two-story brick structure surrounded by a large playground, is in what is now the Green Forest school district. It is the elementary school for Arkansas children who live at Blue Eye. Across the line in Missouri are two more school buildings. One is an elementary school for Missouri children living at Blue Eye and the other is the Blue Eye High School attended by both Missouri and Arkansas students, the latter paying tuition. Blue Eye has one doctor who has served his community since the horse and buggy days. For most of a long life time, no day or night was too stormy or miserable for Dr. C. E. Miller to ride out and answer the call of suffering humanity. SORGHUM MAKING about the turn of the century. Scenes like this one, photographed about 60 years ago on the farm now owned by Ellis Blevins, were once familiar sights in the Ozarks. At left are three brothers, Dan, James M., and Ruel Mayes. One of the other men is Will Mayes, an uncle. MO-ARK ACADEMY as it was nearing completion in 1918. Refereeing the girls basketball game is Academy Principal Louella Austin. The small boy standing with the group of men watching the game is Ray Mayes, now Principal of Branson Elementary School. Station, Mr. Cox; Mills General Store, Mr. and Mrs. Jesse Mills; Buell's Grocery, Mr .and Mrs. Pratt Buell; Post Office and General Dry Goods, Mr. and Mrs. Cue Butler; Gallen's Appliance Store, Mr. and Mrs. Mac Callen; Lakeside Garage, Bob MeClelland; Blue Eye Tobacco Store, Sam Wolfenbarger; and Helton and Sons Cabinet and Miliwork. 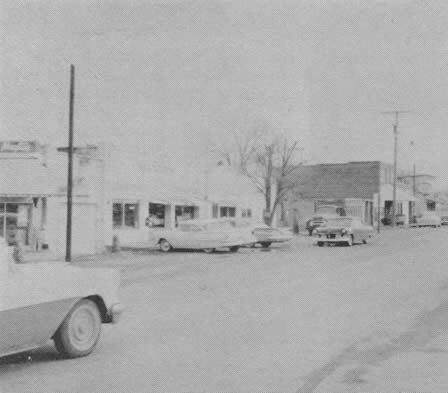 A mile from Blue Eye, at the junction of Highways 13 and 86, are Watkins Grocery, Mr. and Mrs. Dennis Watkins; Dairy Land Drive-In, Mr. and Mrs. Paul Flemming; Rosalee's Beauty Salon, Mrs. Harold Chapman; Joy's Barber Shop, Joy Graham; and Brack's Auto Paints, Brack Herring. The only time Blue Eye received any notoriety was a few years ago when the school children had an epidemic of sore eyes. A county newspaper headed the item with the caption, "Blue Eye Has the Pink Eye". This struck newspapermen as funny and the wire services picked it up and reported it from coast to coast. STREET SCENE about 1916. The first building on the right, of which a corner is visible, is the Baptist Church. The house in the center background was the home of Ben Jones who taught a subscription school for those students desiring more than the usual three months a year. It was the custom of the young men around town to challenge the school boys to games of Dare Base, and such a game was in progress when this picture was taken. After a snow fall, snowball fights replaced Dare Base as the order of the day. STAR SCHOOLHOUSE about 1915, Blue Eye's first school. 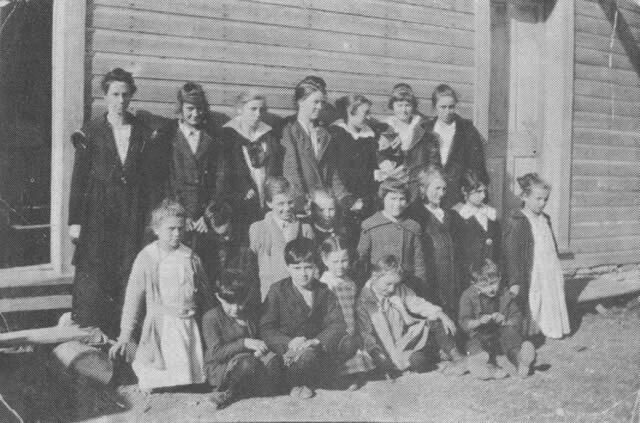 The teacher, Miss Audie O'Neil, is standing in the back row, left. Next to her is Zelpha Kearns, and the girl who is second from the extreme right is believed to be Jewell Butler. The young ladies at the extreme right and left of the first row are Elsie Kearns and Nora Carr. The frame schoolhouse was replaced about 1922 with a new building. Blue Eye has a rare feature not found in many Ozark towns - it is situated on level ground. It is especially attractive in the summer when the neat, white houses show up to their best advantage against the green lawns shaded by elms and dotted with color from the many flower beds. But at any time of the year, the visitors will find that Blue Eye's most attractive feature is its friendly, courteous people. Main street looking south toward Arkansas. 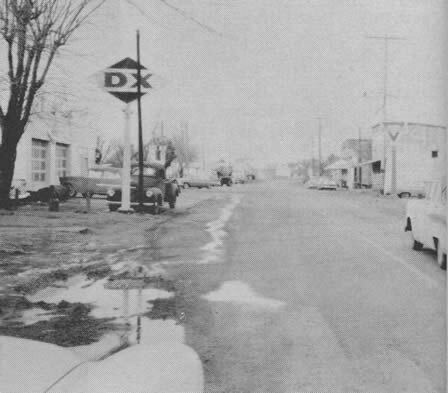 Main street, looking north toward Missouri. Blue Eye High School and Missouri Elementary School. Blue Eye Elementary School for Arkansas children. The building housed the Mo-Ark Baptist Academy until 1930.